August is a busy time in the area, which receives 10 million visitors annually, so eclipse-chasers should expect crowds, congested roadways, and potential closures to manage traffic. That said, the area still has plenty of rental cabins available to stay in, and Cabins Of The Smoky Mountains even has a special for this time period, throwing in a free 3rd night for the price of 2. See the Specials Page to learn more about the “Buy 2 Get 1 Free” cabin special, available August 20 through August 23. To book or just ask questions, call us anytime at 855-91-SMOKY. Great Smoky Mountains National Park has a web page offering all the details and links to further resources you will need to navigate through this exciting opportunity. NASA is deeply involved of course and offers its own website of information and resources. The solar eclipse is of great interest to scientists of course, and both NASA at the national level and park rangers at the local level are fully engaged with the opportunity to study this event. You can join in too, by recording atmospheric data in your locality, by observing animal reactions, and by sending your photographs to NASA’s collection on Flickr. Again, check the two source websites for the national park and NASA to explore the wealth of possibilities open to you. 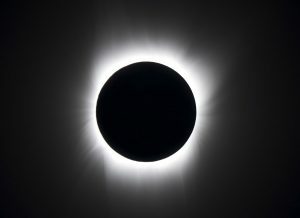 The totality of the eclipse, that band of shadow on the Earth’s surface where the moon completely hides the entire sun, will show in a 67-mile wide path angling across America. Outside of this band, for several hundred miles, you can see the eclipse happening in part, but only in this band are the full effects observable – where the corona of the sun is all that’s visible, and strange light effects occur. To protect your eyes, you CANNOT look at the sun without the correct eye protection. Ordinary sunglasses are not good enough. The fully darkened sun will only last for 2 minutes, if you’re even in the totality band. The rest of the time the eclipse will be in the process of beginning or ending, and you will WANT to look – but don’t do it without the right protection. You can buy disposable solar glasses approved by NASA to give protection, inexpensively and from numerous outlets – and the best thing is to get them in advance. Details about the vierwers are here in this NASA handout: How to tell the safe glasses [pdf]. And locally, see the Great Smoky Mountains Association web page to buy the glasses for just a few dollars: Solar Eclipse Viewers. Also check this GSMA Facebook entry for some warnings and practical details. It happens that the most likely place for rainy weather to occur on August 21 is the Smoky Mountains. Many people will be praying for a sunny day, but if that’s not a good enough guarantee for you, you can still watch the eclipse though the National Park Service’s live stream from Great Smoky Mountains National Park. This is a 4-hour program, from 11:15 am to 3:15 pm CST. NASA has its own Live Stream also, across the country, and you can get lost for hours studying al lthe resources available in THAT section of their Eclipse web site. Here’s the page: NASA Ecllipse Live. Oh, and there’s also an App for it, of course – so you can follow the entire event on your phone. Details on that page. If you here in person, what are your options? The national park has viewing areas in Cades Cove, Clingmans Dome and Oconaluftee. Clingmans Dome itself is being used for media recording, and the parking area has already become fully booked. See the GSMNP Eclipse page linked above for links to ticketing, and resources to help you plan. The special viewing areas promise expert settings for the event, but as with everything in the national park, spaces for people are always limited. Ticketing exists not to make money but to offer a fair way for people to get a space. Here’s an interactive map that shows the lie of the land and how the path of the totality will slice through the region: 2017 Solar Eclipse Totality Duration. Remember, there are plenty of other places within the national park that fall within the Totality, and lots of places outside the park as well. You can plan how best to take advantage of this day, using the resources at the park and also NASA websites. According to the national park web page, Great Smoky Mountains Institute at Tremont is planning a special Camp for the event, filled with science and adventure for young minds – the very thing the Institute does best. No details have surfaced at this time of writing, so it’s not confirmed yet. Check the Tremont Institute website and Facebook page. If you’re anywhere in the national park during this day, please remember that this is a protected space – in fact it’s a UN-designated ecosystem, unique on the whole world. It shelters abundant wildlife and plant life, and the rangers are the best people you could ever hope to meet. They are also the rule givers in the Park. Please be attentive to rules, be patient with delays, and cause no harm to the park or its millions of inhabitants, seen and unseen. Thank you. There are several campgrounds within the park, and rangers expect them to fill up. For more information, as always, start with the GSMNP Eclipse page linked above, and follow the links to the main Park website. Always pay attention to temporary alerts and closures whenever you’re planning to visit the park. Here’s a great page to bookmark: Temporary Road and Facilities Closures. In the Smoky Mountains, rental cabins are abundant, and booking fast. Cabins Of The Smoky Mountains is the region’s largest manager of luxury rental cabins, and top-rated by Southern Living. We’ve mentioned the Special offer above, and we should add that our guests get Gatlinburg & Pigeon Forge coupons worth over $400 during their stay. For ways to find the best cabins for your needs and make the most of your adventure here, check out our various articles in our TIPS section. You might want to start with Cabins: the Best Way to Stay in the Smoky Mountains. And call us day or night, to book a cabin or to ask our advice, 24/7 at 855-91-SMOKY. Outside of the park itself, the pleasant town of Maryville has the good fortune to be almost smack in the middle of the eclipse totality. We’ve written up this town a few times for its excellent sense of fun. Check out its recent 2017 Big BBQ Bash festival. It’s on the “Quiet Side of the Smoky Mountains”, and may offer a way to escape the crowds. Try this event: Great American Eclipse Viewing at Montvale. Tickets are $10-25 and are for the great cause of helping children. This is limited to a thousand people, but if you can get in, you may want to consider renting one of our Wears Valley cabins. In fact, with the totality falling in the western half of the park, and places outside the park and to the west, it’s worth knowing about this more tranquil part of the region west og Gatlinburg and Pigeon Forge. It offers easier ways into the park, and fantastic scenery all around, along with tremendous views of the mountains. Check out our post on Wears Valley – on the Quiet Side. And take a look at our post on Townsend also, on the way to Maryville, another fun town. And as the GSMNP Eclipse page reminds us, 18 of Tennessee’s state parks fall in the totality. If you want to cast farther afield, follow the links to the resource page – or take this shortcut: Total Eclipse in a Tennessee State Park 2017 for information.